Ghost in the Shell: Arise – Ghost Whisper is the second installment in the reboot of the classic series and picks up with Major Kusanagi joining Section 9 with the task of forming her own team to combat threats no other organization can. She hasn’t been in a rush to do so as she is real particular about who she wants to be part of her team. However she won’t have much longer as the trial of Kazuya Soga is underway and he’s charged with committing crimes against humanity. We’re shown how the former Colonel led his team into combat during the war in Qhardistan and how they encountered not only resistance but a hostage situation with the refugees in the area. After the threats are eliminated the Colonel recalls giving one of the little kids a bottle of water in an act of kindness. But somewhere things went terribly wrong as all the refugees would be massacred with the Colonel and his team claiming it was self-defense and believing there was a cover-up. So even though the Colonel would be the only one on trial, this would explain the actions of his former team who believe they have to not only clear the Colonel’s name but theirs as well using very drastic measures. But someone is on to them as what appears to be a recording of them plotting is uploaded to one of the Logicomas that is with the Major along with false memories. However she can’t really figure out what it means or where this intrusion came from. At least that’s the case until the plan is set in motion and there’s an attack on the traffic network that is bigger than anything any of the agencies can handle or overcome. The Colonel’s former team, which includes Batou, apparently got their hands on a module that gives them this capability and in essence they can shutdown the country affecting security, the economy, and threaten the lives of millions of people unless their one demand is met: They want the truth known, or rather all the country’s secrets to be released and will use this module to do so. And now the Major is in their crosshairs because of what was uploaded anonymously to the Logicoma. Can the Major form her team in time to stop this plot or will it be too late? I enjoyed the first border/installment and despite a couple of flaws I felt it was a very solid reboot to the series. The animation was fresh for the most part and the way the characters were introduced and brought together was organic, and set up an interesting dynamic for future installments. I did have an issue with some of the action sequences and this border was action-packed right from the beginning. The opening sequence was interlaced with flashbacks from the war and the tone was set early with the action and a bit of intrigue. I enjoyed the way this was laid out and it made me care about the story that was to come and want to know more about what actually happened. It was an interesting touch that some crucial information would be implanted in the Logicoma anonymously because even though it was possible for the Major to see this information, the Logicoma is very child-like, and this is even shown through their virtual images. 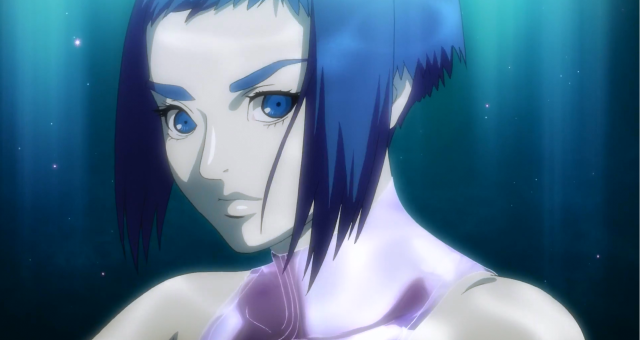 Ghost in the Shell was a series where a little bit of thinking was not only welcomed but encouraged as the issues it presented weren’t treated in simple black and white fashion. So I was approaching this border in that same manner trying to pick up on different hints along the way wondering how it would pay off. And even though it was good to see Chief Aramaki urging the Major to form her team before things reach a critical point where the higher-ups would try to impose their will on the construction of the team, you have to pay close attention or else you’ll miss the story unfolding. It’s not that it’s difficult to understand, it’s just that there’s so much action that takes place you’ll start to think it’s all one long action sequence because you missed the little bit of exposition in between. This isn’t necessarily a bad thing depending on what you would expect from this rebooted series. The action is extremely well done and when you see the action sequence where Batou and his crew goes after Kusunagi while she’s riding her motorcycle, and the slow motion jump she performs your heart will race with excitement. The animation this time around is definitely more fluid and the action sequences are better choreographed. If you love action in anime it’s definitely not lacking here. There is an interesting story that plays out well here but don’t expect anything too thought-provoking this time around. 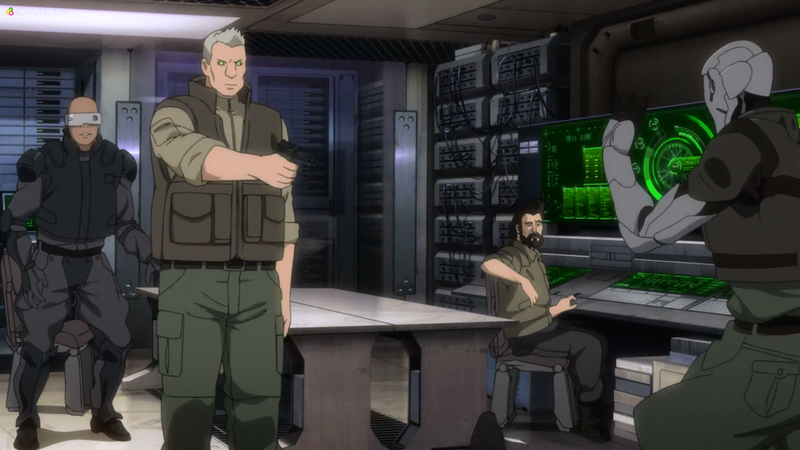 Colonel Soga’s team, led by Batou, somehow gets the American Army Module, a device capable of creating processing power on a national level, and was originally intended to be brought to Japan for top-secret standards sharing. They’re using it to control the traffic network putting millions of lives in jeopardy but they’re also secretly using it to crack open Pandora’s lid and expose all state secrets to the world. Kusunagi receives help from an American agent and they have to find a way to stop this group from using the module in such a destructive way while the mystery of how they originally acquired this device rages on. There is a lot of potential in this story line combined with the overarching issue of people being infected with false memories again, and there’s enough material here to raise some extremely interesting questions. And with other members of the team being introduced in this border but initially on opposite sides of the aisle, the arrangement was perfect for these issues to be addressed in a meaningful way through relevant characters. Most of this, however, was squandered. Interactions between familiar characters are for the most part relegated to action sequences but I have to state that it is handled very well from Kusunagi getting Saito to initially sign on to how Ishikawa is shown the truth. The storyline here is propelled forward through its action sequences. I feel part of that was due to the length of the border and perhaps some of this will be addressed on a deeper level in the next border because of the fascinating revelation at the end of who was ultimately behind this and the conversation between Batou and Kusunagi at the end. Ghost in the Shell: Arise – Ghost Whisper is an action-packed follow-up to Ghost Pain and despite not taking full advantage of the potential in the story line to raise some interesting questions in cyberpunk fashion, it’s still a very thrilling ride. It improved on the first border not only with its incredible action sequences but with the way the story flowed in introducing characters. 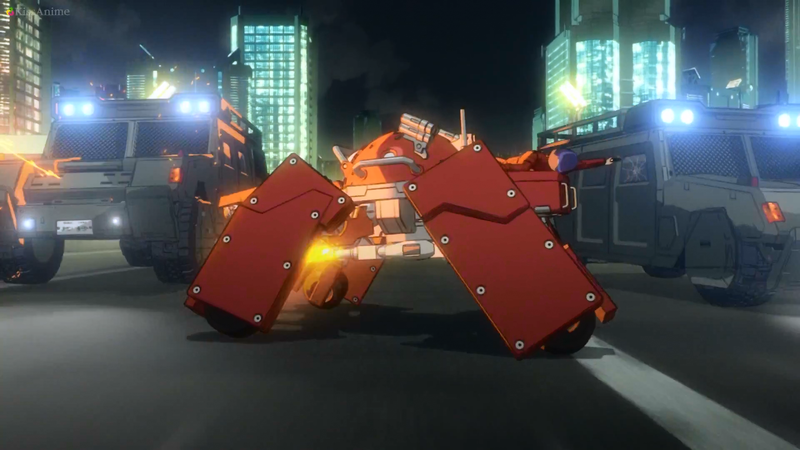 The threat was very real and bigger than any havoc a bomb or explosion could cause and this was in true Ghost in the Shell fashion. The other members of the team are introduced in remarkable fashion and made clear as to why the Major would want them on the team. And with the revelation towards the end of this border I have been pleased with the reboot of this series overall and can’t wait to see the next one.